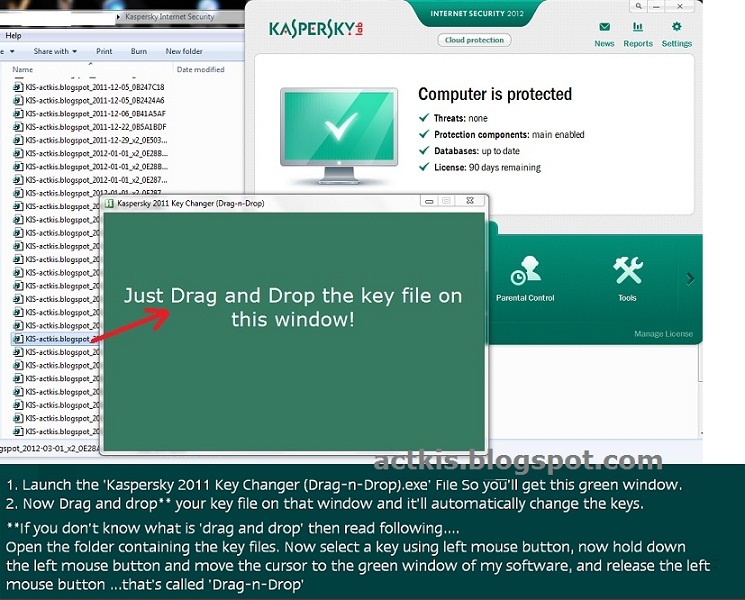 Q. I drag-and dropped the key file but its not working? Kaspersky says my application is not activated? A. Many reasons, but the main is that you've to delete the previously blacklisted keys from the software before you can install the new keys. You can at max have 2 keys in your software. The key file in your harddisk is of different version. Example, you've Kaspersky internet security(KIS) software but you're trying to activate it with Kaspersky Antivirus Software(KAV). Or perhaps the keyfile is already blacklisted or of older version software. Reason#2: You don't have the administrative rights (You are using the computer via guest account etc) that's why program is not installing the keys. Solution: Log in to the different user account with Administrative rights and try again. Q. How to know if it worked or not? or How do I know if keys were installed or not? A. Well just double click on the Kaspersky icon in the traybar and you'll see the Kaspersky window. If on the right side bottom it says 'xyz days remaining' that means it worked. There is a 'avp.com' file in the Kaspersky installation folder, which allows you to install key files via command prompt. I've created a GUI-interface for that avp file, via Autohotkey script. And if you apply your brain, you can create a desktop shortcut for drag and drop and you won't even need my exe file. Now drag and drop keys on it and they'll be installed! Gui, Add, Text, x6 y110 w590 h200 +Center, Just Drag and Drop the key file on this window!